Transport for London (TfL) has confirmed that the final costs for the purchase of 600 new bus for London vehicles, along with the way that the buses are being procured, mean that millions of pounds will be saved over the life of the vehicles. The contract, signed with UK bus manufacturer Wrightbus, includes a competitive, fixed price deal for the vehicles – removing the risk and uncertainty of higher production and material costs, and inflation over the next four years. The average price of a new bus over the life of the contract will be £354,500 – which includes inflation, technical upgrades and mandatory changes including the legal requirement to fit Euro 6 engines to all new vehicles from 2014. At today’s prices the buses cost around £326,000, which is, as TfL has always said, broadly comparable with a standard hybrid double deck bus. The price difference is accounted for by the much higher specification of the new bus compared to a standard hybrid bus. The new bus boasts a number of additional design features, including the innovative three-door, two-staircase design which allows quicker boarding and alighting at bus stops, helping to reduce overall journey times. The bus also heralds the return of the much loved open rear platform which allows passengers to hop-on or off, when a conductor is on board. The new bus is also the greenest diesel electric hybrid bus in the world. The new bus produces around four times less of the PM and NOx of the fleet average hybrid bus, and 20 per cent less CO2. It is also more fuel efficient. The fleet of 600 buses will reduce CO2 emissions in the capital by almost 20,000 tonnes a year. The Euro 6 engine that will be fitted to the buses from 2014 will deliver even lower PM and NOx emissions. 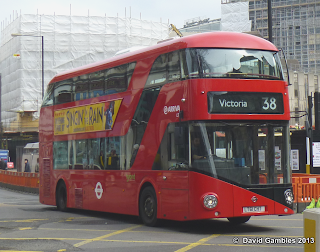 As announced in September last year, TfL has decided to purchase these 600 buses direct from Wrightbus. This has enabled TfL to get a lower unit price because of the bulk order, rather than having bus operators or leasing companies buying smaller batches of vehicles for use on individual routes. TfL fully intends that these new buses will operate for their entire working life – of at least 14 years – in the capital – which means that a multi-million pound saving will be delivered over the useful life of the buses, even taking into account the marginally higher initial cost of the buses. Mayor of London, Boris Johnson, said: “We will ensure these buses more than earn their keep over the next few years. By keeping them in harness in the capital for the entirety of their useful life, we will be extracting every last drop of value out of them. Aside from its Hollywood blockbuster good looks, this bus offers an unparalleled passenger experience and is helping to improve the capital’s air quality. The NBfL project is also creating jobs and stimulating the UK economy. The order for 600 buses – the largest order of hybrid buses in Europe – has created jobs at Wrightbus and in addition, many components of the new bus, including engines, chassis, superstructure and seats and wheelchair ramps, are manufactured in the UK. The order of components from companies across the UK will also further stimulate the economy and sustain jobs.